New Braunfels, TX - Detex's improved Outdoor Area System offers gate and door security ideal for retail buildings that have areas exposed to the weather, such as garden centers, restaurant patios, and lumberyards. 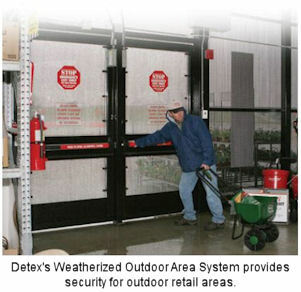 Detex Corporation now offers a life safety and security hardware system, such as weatherized delayed egress hardware, to prevent shoppers from slipping out with merchandise, designed specifically for retail buildings that have areas exposed to the weather. For garden center gates, restaurant patios, lumberyards, or building doors that at times stand open, the Outdoor Area System offers gate and door security without concern about hardware deterioration from exposure. Certain retail applications require a combination of components, and the Outdoor Area System features a range of hardware designed for those needs. In addition, the system is scalable for more complex application requirements. Retail customers can select the exact combinations of components that suit their particular application and know that they will integrate easily with each other and function well in rain, snow and heat. Other Outdoor Area System components include Detex access control devices that allow entry from an outside courtyard with a keypad or card reader and door prop alarms that produce an audible warning when a door is being propped or held open. To learn more about Detex weatherized systems, e-mail marketing@detex.com or visit http://www.detex.com.